Consumers do research online before buying in today’s digital world. Most business owners note this fact. However, what if you have a longer buying cycle? People who need to think a bit on your product before making a decision? Or want to check out a few companies in addition to yours for comparison? Lead nurturing is a term used to define how we stay in front of someone who is not quite ready to buy from you at the time they visit your website. The goal with lead nurturing is to stay top of mind so when this person is ready to buy, he comes back to you and your business. 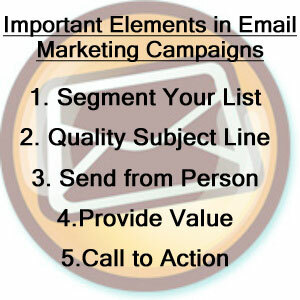 Email marketing is one of the most prominent tools used for lead nurturing. According to a 2013 National DMA email report quoted by Hubspot, 89% of markets consider email important to their organization goals. What’s more, 56% of marketers plan to focus more on their email campaigns in 2013 than they did last year. Opportunities to keep email subscribers engaged increase when you give them a targeted message specific to their situation. Separate your lists to give them a more relatable message – options include gender, customer v. prospects, which service they use, etc. Think of how many emails you receive each day. The first step of getting email marketing to work is getting them to open the email. Make your email standout with an unusual headline or using their first name. Be creative but don’t be deceiving. How many emails do you delete that come straight from a company, thinking it’s spam? I give an email a second look if it comes from a person. So choose someone within your organization to assign as the sender. Maybe you have experts in each area that can align with content – email comes from Bob when it’s about tips and tricks and from Jane when it’s about an event. Give me a good piece of advice for free. Don’t just try to sell. Consumers are more likely to buy from places they perceive as experts, so seed your expertise. Email marketing is a great tool for driving website traffic. Ask readers to click through to the website for additional tips, watch a demo, etc. Ask them to do something that might help move them forward in your sales funnel. If you don’t, they’ll hit delete and then your opportunity is lost. Don’t have time to execute an email marketing campaign or need support to get started? We’re happy to help – Call us at (608) 441-3638.